Mary la Barge visited the area in 2007 and 2009. Her interest in holy wells captured the imagination of Celsus Sheridan, Woodlawn Heritage Group to do something to promote and conserve one of the lesser known heritage sites. …I headed for Woodlawn. I had some brief information about the area and knew that it is named for an estate, Woodlawn House, which is now uninhabitable. But my real interest here are the two holy wells about which I have a bit of information. Maire MacNeill’s scholarly book entitled Festival of Lughnasa; A Study of the Survival of the Celtic Festival of the Beginning of Harvest, Oxford University, 1962, indicates two holy wells exist nearby. I began looking for local people who might be able to help me with their exact locations. I stopped at a house where Daniel and Carrie Attwood invited me in for tea and conversation. 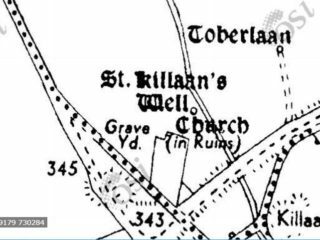 On hearing of my interest in holy wells, they phoned a postman friend who was born in the area and involved in local history; Celsus Sheridan came by and was very interested in reading my textual information; he thinks he knows the location of the wells. The one called Tobar a’Domhnaigh (Toberdoney) is in Cross – Benbeg and Ballyfa is also mentioned in the descriptive information. He showed me the approximate location on my map. The other well is outside a graveyard called Killaan. He knows the graveyard but doesn’t know exactly where the well might be. He seems excited about the prospect of helping me locate the well and wants to go with me and have a look. We drove down to the graveyard and both went into an adjoining field where cows were grazing. We looked around and saw some stones that appeared to be piled up on a mound within a circular area ringed with trees. 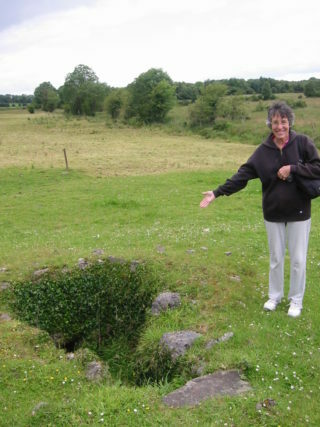 There were the remains of a low circular wall and these formations suggested to me the possibility of the holy well. I will see if I have an ordnance survey map for this area and photocopy the part that would indicate a more exact the location of the well. When O’Donovan was engaged on the Ordnance Survey in 1838 he found that a pattern used to be held at Tobar Leadhain near the old church on Garland Sunday, also called Domhnach na bhFear or Domhnach Chrom Dubh, in honour of St. Laan, the patron of the church. Two years later I was in the Woodlawn area again and called Celsus and arranged to stop by his house. Arriving in the area a bit before the time we had arranged to meet, I went to the graveyard and over to the group of trees that Celsus and I had assumed was the location of the holy well two years ago. The area looked slightly different, a bit trimmed up and someone had put up fencing to surround the little tract of land to keep cattle out. I was a bit mystified; however, later Celsus said that a group of local people got together and had cleaned the site up a bit. All because I had asked about it two years ago!! St Laan or St. Ann? An anthropologist has been called in to assist the local heritage group and is trying to verify the well’s name – it may be St. Ann’s. I can’t help wondering if the name given in MacNeill’s article, which is St. Laan, might be seen as a variation of St. Ann in today’s research efforts; but that seems in direct conflict with the name and connection to St. Patrick’s household posed by O’Donovan. I must admit that I was flattered that my inquiry, and no doubt Celsus’ enthusiasm, had started some sort of conservation effort.